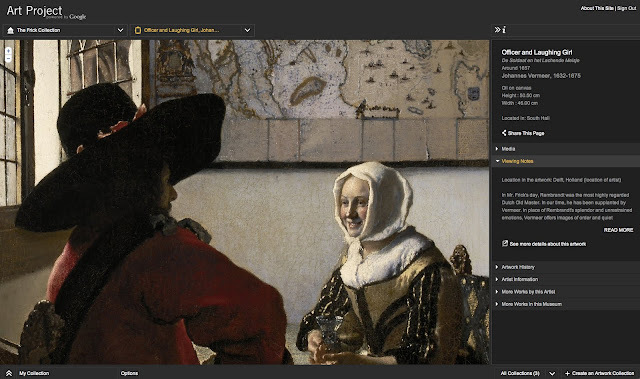 Since its introduction in February, the Google Art Project(GAP) has caused much discussion in public and academic circles. Its usefulness has been demonstrated by prominent art writers such as James Elkins at the Huffington Post, commenting on Bellini's St Francis in The Frick Collection. In his interview at 3PP, Noah Charney spoke of it as an important step towards the realisation of an art researcher's dream. I have used it several times in posts, even earlier this week when commenting on a Bruegel piece at Alberti's Window. It also supplied the central Botticelli image in my post on Marian iconography and the Virgo Lactans motif. As useful as it has been, I have had some concerns about the project. These are not around the arguments whether it is 'replacing' the museum experience, but instead what the project is doing to improve and expand. 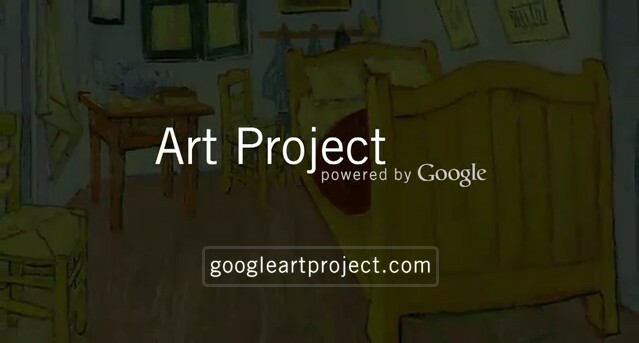 Unlike other Google project areas such as docs and mobile, the Art Project has no team blog which reports the progress of the project and any upcoming enhancements or response to feedback. Project leader Amit Sood had introduced the project at the Google Team Blog, and partner organisations such as the Tate did their own features, but there have been no new announcements or updates since this. I have heard from several users who have had difficulty navigating and saving the portfolio collections and will readily admit this feature, whilst useful is not user as user friendly as it could be. The search functionality within the interface is quite disappointing - particularly considering Google's primary expertise is search engine tech. To remedy this, I created a custom search engine for the GAP using Google's own Custom Search Engine(CSE) tools - a simple task which Google could easily have done themselves, but did not. 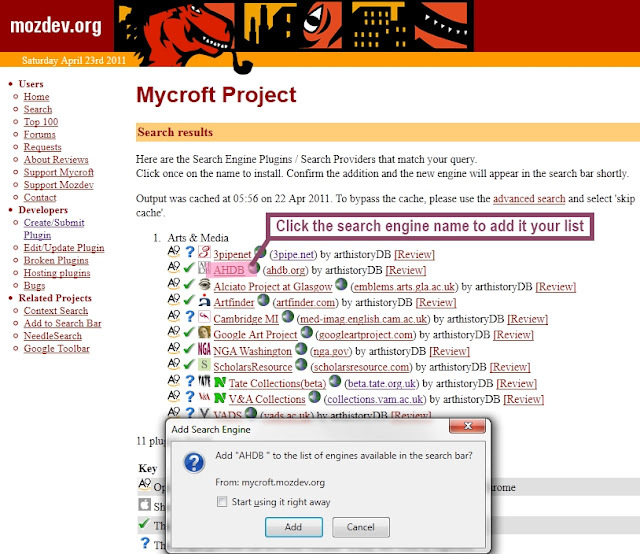 This search plugin can be installed with any browser which is OpenSearch compatible, such as Firefox, Internet Explorer and Chrome. It is installed via a simple click and allows you more thoroughly search the GAP, including for mentions of an artist or work. Here is how it looks in Firefox - the installed search engines on the right can be quickly selected - simply type in your search item and it will find that item in the selected search engine. In this example, I found Bruegel's Dutch Proverbs so I could link to it at Alberti's Window. The great thing is that a search engine plugin can be created for almost any open or closed search engine, provided you have access. If you do not feel confident to do this yourself, I am quite happy to create one as part of the work I am doing for the Art/History Database or AHDB. The plugins created so far can be viewed and installed here (via mozilla developers Mycroft Project). Whilst commentary on the impact of the GAP has been offered freely, a more quantitative approach will yield better insights into how it is being used and what impact this is having. Ioanna Panagiotopoulou, a researcher from Erasmus University of Rotterdam is looking into this topic as part of a Masters Thesis. I would encourage everyone who has ever used the GAP to please fill in the 5 minute survey that has been assembled using the powerful but simple to use Qualtrics platform. Ioanna is also interested to hear from survey participants that would like to be interviewed to further explore the topic. Please pass this information around! Gathering this data is a vital step in the process of having user guided improvements fed back to Google and their partner agencies working on this(and similar projects). Yeah I was on the site the other day and was finding the navigation a bit clunky - I don't see the benefit of only being able to search by museum. There could be some tool for saving 'snippets' of images as well - the novelty of it is the amazing zoom capability, so it'd be good to be able to save a portion you've zoomed into - like a 'location' on google maps almost. @Heidenkind - Google and their partner agencies are perfectly capable of doing a far more extensive assay of user patterns for this initiative. I definitely have no interest in working for 'the Goog'! What a great idea! I look forward to using this tool. You should pitch this idea to Google! Like others, I also have found the navigation of Google Art Project site to be a bit clunky. In fact, I've been a little put-off from using the site because of the design; I still tend to use ARTSTOR more frequently than Google Art, simply because ARTSTOR is better designed and "easier on the eyes." ARTSTOR is of course fabulous, but beyond the access of many of us who are not part of affiliated institutions. It's always frustrating to be behind paywalls to get basic access to educational resources. These organisations could still make money without charging less well monied end users for access to their resources. The closing off of knowledge is part of an old mindset that is slowly going to dissolve as more web resources adapt a democratising open access framework. I myself am eagerly awaiting book digitisers to become commonplace items. This will give the publishing industry a kick up the backside not unlike that experienced by the music industry in the last 10 years. They will have to adapt at much faster rate than the crawl they are presently travelling at!